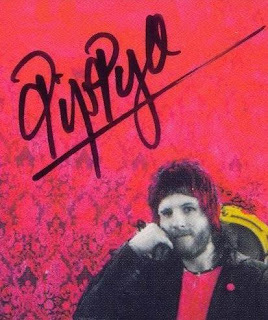 Un anno fa se ne andava Pip Pyle. 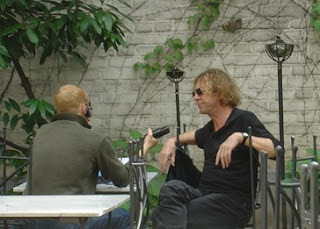 The interview took place at the London home of artist and friend Tim Shepard, who created the album cover of The Unfairground (he's occasionally audible in the background.) Kevin talks about his life, Robert Wyatt, Phil Manzanera from Roxy Music, Syd Barrett and David Bowie. He talks about William Burroughs - the inspiration for his band "The Soft Machine" and starts by explaining the meaning "The Unfairground". "A long and extraordinarily fruitful partnership started here - continuing through the Sogennantes Linksradikales Blasorchester - where Alfred and Heiner picked up Christoph Anders, the three of whom then went on to co-found Cassiber, with Chris Cutler. A critical success in its own time, this duo recorded two more CDs before parting company, each more musically open than its predecessor. 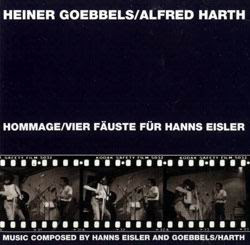 These first two sorties are a kind of jazz-inflected, punk-inflected, highly spirited and imaginative - series of adapted Hanns Eisler compositions - as well as some original pieces by the duo itself, who between them cover a lot of instruments, and combinations of instruments, and - ah youth - are never less than hurling themselves into their performances. Heiner went on, after Cassiber, to become one of Germany's leading music-theatre writer and directors, as well as composing for the ensemble modern, orchestras and opera companies (he had an orchestra premiere to mark the opening of the Festival Hall complex in London on July 12th). Alfred went on to form several other bands, including Gestalt et Jive before relocating to Seoul in Korea, where he now lives and works. He is currently part of Otomo Yoshihide's New Jazz Orchestra. Both original LPs have been re-mastered for this release by Bob Drake." "As you may already know, Paul Rutherford was found dead in his flat in S.E. London on August 5. The cause of death was sclerosis of the liver and a ruptured aorta. 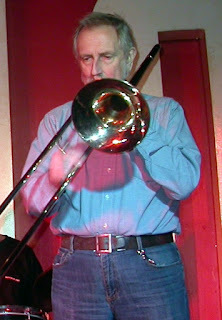 Paul was one of the pioneers of free improvisation, and many consider him to have been the finest trombonist and one of the finest improvisers in the area. He was certainly a very distinctive musician – many players had been influenced by him to some degree (not only trombonists), but no one sounded anything like him. 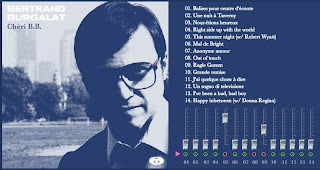 Among his most important performances were his unaccompanied solos, and those in his trio Iskra 1903 that contained Barry Guy and either Derek Bailey or Philipp Wachsmann. He was a gentle, kind man with an outrageous sense of humour, and will be sorely missed. However, he also suffered from bouts of depression, and was frustrated that he was not recognised more widely. For those who are able to attend, the funeral will be on Thursday August 16 at 10:30 am at Lewisham Crematorium in Hither Green Cemetery on Verdant Lane, London SE6 1JX. [The nearest station is Grove Park (trains from Charing Cross, Waterloo East & London Bridge). From there, it is about a 20 minute walk, or buses 124 or 284 can be boarded from the bus stop in Downham Way.]" 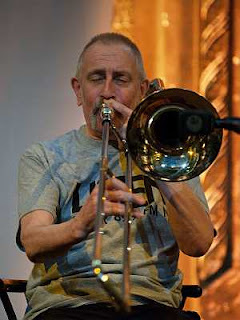 "Yesterday I learned that the great English trombonist and improviser Paul Rutherford died August 6 at the age of 67. The third recording of solo trombone that I heard (after Albert Mangelsdorff’s Tromboneliness and Stuart Dempster’s In the Great Abbey of Clement VI) was Paul’s The Gentle Harm of the Bourgeoisie (Emanem). Although I was very interested in improvised music, this was one of those records that I really didn’t get at first. Precisely for this reason, I kept coming back to it, and it wasn’t long before I found myself trying to incorporate elements of what I took him to be doing into my own playing. 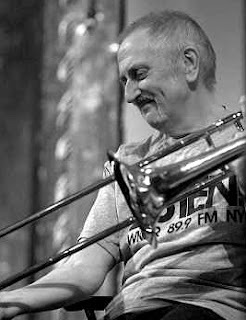 Eventually, of course, I came to realize that that recording is an essential document of improvised music, as are many others that he made, and for years now I have thought of Paul as one of the major influences on my own approach to the trombone. I was fortunate to have several opportunities to play and record with him, in a group at the Empty Bottle festival in 2002 and with Globe Unity Orchestra in 2006 and 2007. Especially on those later occasions, it was clear that his health was not good. I was extremely impressed by the fact that he did not at all let that affect his commitment or focus on the performances we did then, and in talking with him it was obvious that his passion for music was undimmed. He played beautifully every time I heard him. I’ll continue to aspire to the things he showed me." Paul Rutherford, figura storica del free britannico più illuminato e uno dei migliori esperti del suo strumento, il trombone, è morto stamattina all'età di sessantasette anni. Dalla fine degli anni sessanta a oggi ha preso parte a tutte le esperienze più importanti del jazz europeo, dalle varie incarnazioni Iskra ai grandi collettivi (le orchestre di Mike Westbrook, la Globe Unity, la London Jazz Composers' e la Dedication sopra tutte) alle innumerevoli formazioni con John Stevens, Lol Coxhill, Han Bennink, Anthony Braxton, Paul Lovens, Elton Dean, Keith Tippett, Evan Parker - per un brevissimo periodo perfino con Soft Machine - eccellendo anche nei concerti e negli album in solo. Lascia una discografia ricca e variegata, con titoli soprattutto su Emanem e Fmp. Yesterday I finished recording the new Vril album with me on bass and a bit of guitar, Chris Cutler drumming, Lukas Simonis and Pierre Omer on guitars. As with the first album we worked out and recorded the basic tracks "live" here at my studio, all set up in the same room. With the addition of Pierre we are a complete band now and thinking about doing some gigs in Europe. 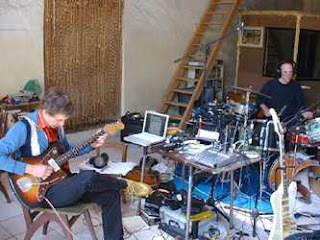 I'll get to mixing the album later this year, and presume it will be released early in 2008. Nel numero di agosto di Harp, Emily Haines - figlia del poeta Paul Haines, scomparso nel 2003, e noto ai più per essere l'autore del libretto del bleyano Escalator over the Hill - scrive a proposito di Robert Wyatt, ricordandone l'amicizia col padre e descrivendone l'influenza sulla propria formazione e anche sulle proprie scelte artistiche. Di Emily Haines è appena uscito un e.p. con materiali che risalgono alle sedute di registrazione di Knives don't have your Back, suo debutto lo scorso anno come solista a margine degli impegni a tempo pieno nel gruppo Metric. L'e.p. si intitola What is Free to a Good Home, da una poesia scritta dal padre per Wyatt. Di Paul Haines esce in questo stesso periodo Secret Carnival Workers, un'antologia di poesie, narrativa e vari scritti. 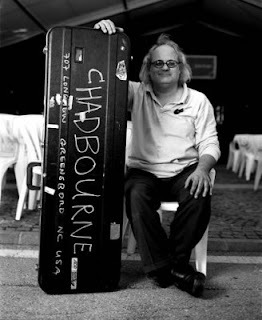 Eugene Chadbourne è curatore e protagonista di Chadfest 2007, in programma nella seconda metà di agosto presso il locale newyorchese The Stone ('Dr. Chadbourne comes up from Greensboro for two weeks of madness, horror, humor and political intrigue'). La prima parte del mese è curata da un altro eccellente chitarrista, Duck Baker.